Paleolithic Europe, the Lower or Old Stone Age in Europe encompasses the era from the arrival of the first archaic humans, about 1.4 million years ago until the beginning of the Mesolithic (also Epipaleolithic) around 10,000 years ago. This period thus covers over 99% of the total human presence on the European continent. The early arrival and disappearance of Homo erectus and Homo heidelbergensis, the appearance, complete evolution and eventual demise of Homo neanderthalensis and the immigration and successful settlement of Homo sapiens all have taken place during the European Paleolithic. the Lower Paleolithic, from the earliest human presence (Homo antecessor and Homo heidelbergensis) to the Holstein interglacial, c. 1.4 to 0.3 million years ago. The oldest evidence of human occupation in Eastern Europe comes from the Kozarnika cave in Bulgaria where a single human tooth and flint artifacts have been dated to at least 1.4 million years ago. In Western Europe at Atapuerca in Spain, human remains have been found that are from 1.2 million years ago. Five Homo erectus skulls were discovered at an excavation site in Dmanisi, Georgia. Unearthed in 2005 and described in a publication in 2013, the Dmanisi skull 5 is estimated to be about 1.8 million years old. 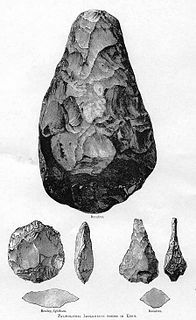 The earliest evidence for the use of the more advanced Mode 2-type assemblages Acheulean tools are 900,000 year-old flint hand axes found in Iberia and at a 700,000 year-old site in central France. Notable human fossils from this period were found in Kozarnika in Bulgaria (1.4 mya), at Atapuerca in Spain (1.2 mya), in Mauer in Germany (500k), at Eartham Pit, Boxgrove England (478k), at Swanscombe in England (400k), and Tautavel in France (400k). The oldest complete hunting weapons ever found anywhere in the world were discovered in 1995 in a coal mine near the town Schöningen, Germany, where the Schöningen spears, eight 380,000-year-old wooden javelins were unearthed. 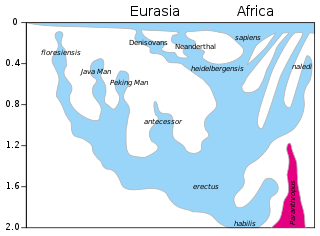 Approximate ranges of pre-Neanderthal (H. heidelbergensis) and early Neanderthal (purple) and of classical and late Neanderthal (blue). Elements of the European and African Homo erectus populations evolved between 800,000 to 400,000 years ago through a series of intermediate speciations towards Homo antecessor and Homo heidelbergensis. Fossils of the species Homo neanderthalensis are only to be found in Eurasia. Neanderthal fossil record ranges from Western Europe to the Altai Mountains in Central Asia and the Ural Mountains in the North to the Levant in the South. Unlike its predecessors they were biologically and culturally adapted to survival in cold environments and successfully extended their range to the glacial environments of central Europe and the Russian plains. The great number and in some cases exceptional state of preservation of Neanderthal fossils and cultural assemblages enables researchers to provide a detailed and accurate data on behavior and culture. 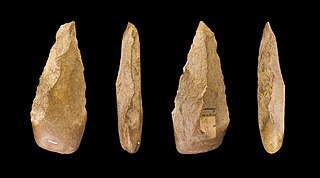 Neanderthals are associated with the Mousterian culture (Mode 3), stone tools that first appeared approximately 160.000 years ago. Experts debate over whether a flute from the Divje Babe I cave is evidence that the Middle Paleolithic Neanderthal inhabitants of Europe may have made and used musical instruments. Modern human remains dating to 43,000–45,000 years ago have been discovered in Italy at Grotta di Fumane near Verona and Grotta del Cavallo and in Britain. The bearers of most or all Upper Paleolithic technologies were H. sapiens. Some locally developed transitional cultures (Szletian in Central Europe and Chatelperronian in the Southwest) use clearly Upper Paleolithic technologies at very early dates and there are doubts about who were their carriers: H. sapiens, Neanderthal or the interbred population. Nevertheless, the definitive advance of these technologies is made by the Aurignacian culture. The origins of this culture can be located in what is now Bulgaria (proto-Aurignacian) and Hungary (first full Aurignacian). By 35,000 BCE, the Aurignacian culture and its technology had extended through most of Europe. The last Neanderthals seem to have been forced to retreat during this process to the southern half of the Iberian Peninsula. The first works of art appear during this phase. Burins of the Gravettian culture. Around 32,000 BCE, the Gravettian culture appears in the Crimean Mountains (southern Ukraine). Around 22,000 BCE, the Solutrean and Gravettian cultures reach the southwestern region of Europe. The Gravettian technology/culture has been theorized to have come with migrations of people from the Middle East, Anatolia, and the Balkans. The cultures might be linked with the transitional cultures mentioned before, because their techniques have some similarities and are both very different from Aurignacian ones but this issue is thus far very obscure. The Gravettian soon disappears from southwestern Europe, with the notable exception of the Mediterranean coasts of Iberia. The Gravettian culture also appears in the Caucasus and the Zagros mountains. 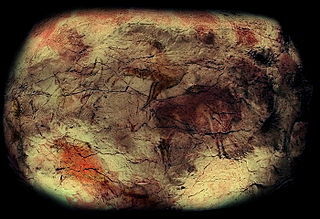 The Solutrean culture, extended from northern Spain to SE France, includes not only an advanced stone technology but also the first significant development of cave painting, the use of the needle and possibly that of the bow and arrow. The more widespread Gravettian culture is no less advanced, at least in artistic terms: sculpture (mainly venuses) is the most outstanding form of creative expression of these peoples. Around 17,000 BCE, Europe witnesses the appearance of a new culture, known as Magdalenian, possibly rooted in the old Aurignacian one. This culture soon supersedes the Solutrean area and also the Gravetian of Central Europe. However, in Mediterranean Iberia, Italy and Eastern Europe, epi-Gravettian cultures continue evolving locally. With the Magdalenian culture, Paleolithic development in Europe reaches its peak and this is reflected in the advanced art, owing to the previous traditions of painting in the West and sculpture in Central Europe. Around 10,500 BCE, the Würm Glacial age ends. Slowly, through the following millennia, temperatures and sea levels rise, changing the environment of prehistoric people. Nevertheless, Magdalenian culture persists until circa 8000 BCE, when it quickly evolves into two microlithist cultures: Azilian, in Spain and southern France, and Sauveterrian, in northern France and Central Europe, which are described as either Epipaleolithic or Mesolithic. Though there are some differences, both cultures share several traits: the creation of very small stone tools called microliths and the scarcity of figurative art, which seems to have vanished almost completely, being replaced by abstract decoration of tools, and in the Azilian, pebbles. In the late phase of this Epipaleolithic period, the Sauveterrean culture evolves into the so-called Tardenoisian and influences strongly its southern neighbour, clearly replacing it in Mediterranean Spain and Portugal. The recession of the glaciers allows human colonization in Northern Europe for the first time. The Maglemosian culture, derived from the Sauveterre-Tardenois culture but with a strong personality, colonizes Denmark and the nearby regions, including parts of Britain. ^ Nicholas Toth & Kathy Schick (2007). Handbook of Paleoanthropology. Berlin; Heidelberg: Springer. p. 1963. ISBN 978-3-540-32474-4. ^ a b c d Emma Groeneveld (September 29, 2017). "Paleolithic". Ancient History Encyclopedia Limited. Retrieved January 22, 2019. ^ "'Fossil find is oldest European yet'". Nature News. 2008-03-26. ^ Moncel, Marie-Hélène; Despriée, Jackie; Voinchet, Pierre; Tissoux, Hélène; Moreno, Davinia; Bahain, Jean-Jacques; Courcimault, Gilles; Falguères, Christophe (2013). "Early Evidence of Acheulean Settlement in Northwestern Europe – La Noira Site, a 700 000 Year-Old Occupation in the Center of France". PLoS ONE. 8 (11): e75529. Bibcode:2013PLoSO...875529M. doi:10.1371/journal.pone.0075529. PMC 3835824. PMID 24278105. ^ Arlette P. Kouwenhoven (1997). "World's Oldest Spears". Nature. 385 (6619): 767–768. Bibcode:1997Natur.385..767D. doi:10.1038/385767a0. Retrieved January 12, 2019. ^ "Early Human Evolution: Homo ergaster and erectus". palomar edu. Retrieved January 13, 2019. ^ "Homo heidelbergensis – Comparison of Neanderthal and modern human DNA suggests that the two lineages diverged from a common ancestor, most likely Homo heidelbergensis". Smithsonian Institution. Retrieved September 26, 2016. ^ Edwards, Owen (March 2010). "The Skeletons of Shanidar Cave". Smithsonian Magazine. Retrieved 17 October 2014. ^ Benazzi, S.; Douka, K.; Fornai, C.; Bauer, C.C. ; Kullmer, O.; Svoboda, J.F. ; Pap, I.; Mallegni, F.; Bayle, P.; Coquerelle, M.; Condemi, S.; Ronchitelli, A.; Harvati, K.; Weber, G.W. (2011). "Early dispersal of modern humans in Europe and implications for Neanderthal behaviour". Nature. 479 (7374): 525–8. Bibcode:2011Natur.479..525B. doi:10.1038/nature10617. PMID 22048311. ^ Higham, T.; Compton, T.; Stringer, C.; Jacobi, R.; Shapiro, B.; Trinkaus, E.; Chandler, B.; Gröning, F.; Collins, C.; Hillson, S.; o’Higgins, P.; Fitzgerald, C.; Fagan, M. (2011). "The earliest evidence for anatomically modern humans in northwestern Europe". Nature. 479 (7374): 521–24. Bibcode:2011Natur.479..521H. doi:10.1038/nature10484. PMID 22048314. ^ "Skull fragment sheds light on Neanderthal and human interbreeding". The Telegraph. January 28, 2015. Retrieved January 22, 2019. ^ Deborah Olszewski. "Middle East: Epipaleolithic". Researchgate. Retrieved January 22, 2019. ^ Ines Medved. "Continuity vs. Discontinuity, Epipaleolithic and Early Neolithic in the Mediterranean Southeast of the Iberian Peninsula" (PDF). University of Cologne. Retrieved January 22, 2019. ^ "Mesolithic Culture of Europe" (PDF). Eacharya Inflibnet. Retrieved January 22, 2019. The Lower Paleolithic is the earliest subdivision of the Paleolithic or Old Stone Age. It spans the time from around 3.3 million years ago when the first evidence for stone tool production and use by hominins appears in the current archaeological record, until around 300,000 years ago, spanning the Oldowan and Acheulean lithics industries. Prehistoric Europe is the designation for the period of human presence in Europe before the start of recorded history, beginning in the Lower Paleolithic. As history progresses, considerable regional irregularities of cultural development emerge and increase. The region of the eastern Mediterranean is, due to its geographic proximity, greatly influenced and inspired by the classical Middle Eastern civilizations, and adopts and develops the earliest systems of communal organization and writing. The Histories of Herodotus is the oldest known European text that seeks to systematically record traditions, public affairs and notable events. In contrast, the European regions furthest away from the ancient centers of civilization tended to be the slowest, regarding acculturation. In Northern and Eastern Europe in particular, writing and systematic recording was only introduced in the context of Christianization, after 1000 CE. Human taxonomy is the classification of the human species within zoological taxonomy. The systematic genus, Homo, is designed to include both anatomically modern humans and extinct varieties of archaic humans. Current humans have been designated as subspecies Homo sapiens sapiens, differentiated from the direct ancestor, Homo sapiens idaltu. Homo erectus is a species of archaic humans that lived throughout most of the Pleistocene geological epoch. Its earliest fossil evidence dates to 1.8 million years ago. 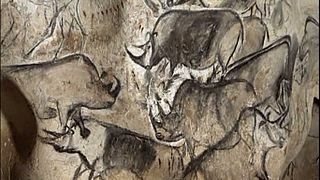 Under the name Cave of Altamira and Paleolithic Cave Art of Northern Spain are grouped 18 caves of northern Spain, which together represent the apogee of Upper Paleolithic cave art in Europe between 35,000 and 11,000 years ago. They have been collectively designated a World Heritage Site by the UNESCO in 2008. The small Sirgenstein Cave, German: Sirgensteinhöhle is situated 565 m (1,854 ft) above sea level inside the 20 m (66 ft) high Sirgenstein, a limestone rock. The cave sits 35 m (115 ft) above the Ach River valley bottom in the central Swabian Jura, southern Germany. Archaeologist R. R. Schmidt excavated the site in 1906 during which he identified indices of prehistoric human presence. He recorded the complete stratigraphic sequence of Palaeolithic and Neolithic origin. In his 1910 analysis Schmidt inspired future archaeologists with his pioneering concept of including the excavation site within its geographic region, contextualizing it within a wide scientific spectrum and demonstrated valuable results as he correlated the Sirgenstein layer structure to those of prehistoric sites in France. Aroeira 3 is a 400,000 year old Homo heidelbergensis hominid skull which was discovered in the Aroeira cave, Portugal. It is the earliest human trace in Portugal. H. heidelbergensis existed at the transition between Homo erectus and early Neanderthals and used both stone tools and fire. The skull was damaged during the 2014 excavation but was restored in the following two years. In 2017 the description of the skull was published in PNAS. It is on display in the National Archaeology Museum (Lisbon).